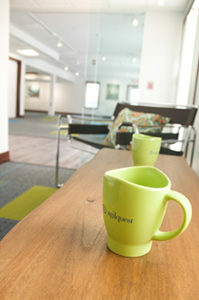 Spacious, comfortable rooms available for meetings or heads down work. Created for use “on demand” – by the hour, day, week, month – as a place to where you can collaborate with other professionals, meet people who can help you grow, use the space for work…or for life’s events! We warmly welcome all passionate people who love what they do, and want to do it in a place they can love. Love it inside and outside in our planned beautiful, furnished gazebo and fire pit. Take a break on the lawn and sit under the trees. It’s a place that’s calm, stimulating and different. Enjoy it occasionally or on an ongoing basis. 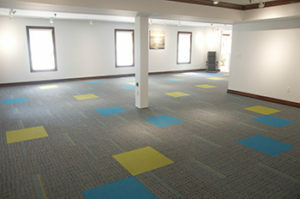 AgilSpace has a large open area for collaborative work, but the furniture can be quickly removed for an event. 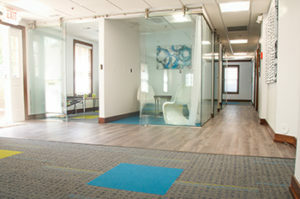 Floor to ceiling glass walls for huddle rooms (for private conversations) and conference rooms gives an open feeling while being acoustically private. 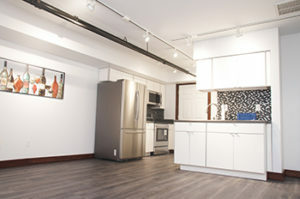 There is a fully equipped kitchen with lounge area complete with tables, seating and…a planned bar! Contact Jessica Debus at jessica.debus@agilquest.com to reserve your space! You need a nice space, but don’t want to own it. That’s ok, we’ll share ours with you! Rentable office and event space for work, worship, fun and more, AgilSpace is minutes from Brandermill/Woodlake and downtown Richmond, situated in a secluded courtyard, surrounded by trees, landscaping and tranquility.